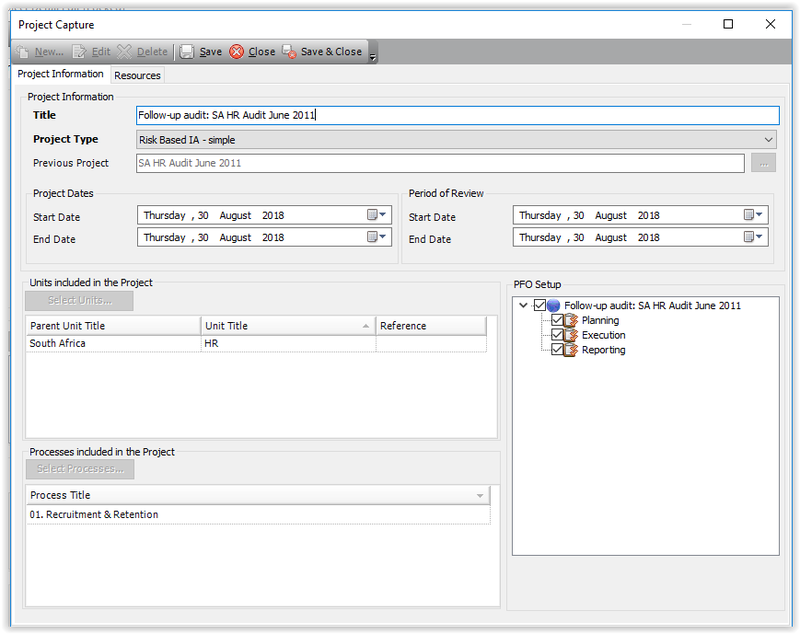 You can create a follow-up Audit project in BarnOwl, based on a previously completed Audit project. After you complete an Audit project, you can create a follow-up audit to ensure that any findings against the unit or process have been addressed. BarnOwl will automatically use all the unit and process information from the original project, and you can set new audit dates and add resources. 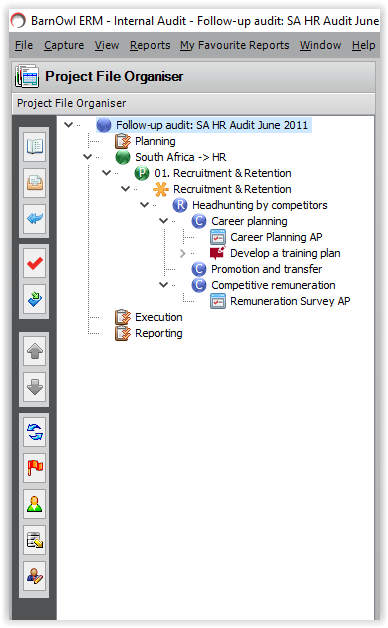 An Audit project must have one of the following statuses to enable the creation of a follow-up Audit. 1.Open the project for which you wish to create a follow-up Audit in the PFO. 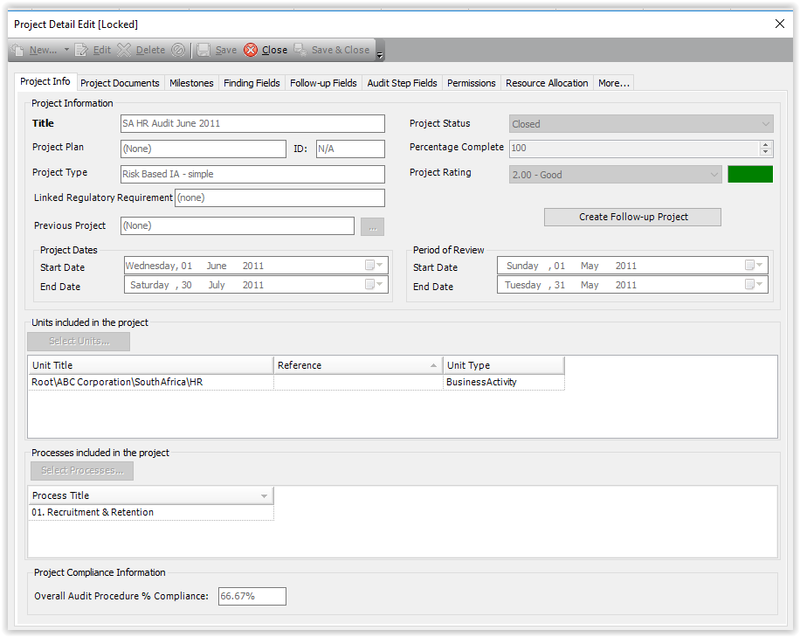 2.Click the button in the PFO to open the Project Detail form. 3. Click the Create Follow-up Project button. 4. The Audit Capture form opens. All linked processes, units, risks and controls are pulled through to the follow-up project, but you will not be able to edit the processes or units. 5. You can now specify the start and end dates and period of review, as well as adding resources. The original resources will not be pulled through, so you need to add at least one resource. 6. When you have added all information, click Save & Close. You will receive a message that the follow-up Audit project has been created successfully. Click Yes to open the follow-up project in the PFO. The PFO toolbar displays a dark background. All the items from the original Audit project are shown.